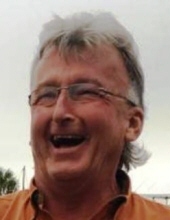 MANNING – Donald Scott Bannister, 60, husband of Mary Renee Alberth Bannister, died Tuesday, April 2, 2019, at McLeod Health Clarendon. Born December 1, 1958, in Huntington, West Virginia, he was a son of Joice Woodyard Bannister and the late Donald Cecil Bannister. He was a heavy equipment operator in construction. He is survived by his wife and mother of Manning; and a grandson, Donald Scott Bannister III of West Virginia. In addition to his father, he was preceded in death by a son, Donald Scott Bannister II; and two sisters, Tammy Kennedy and Traci Dawn Bannister. To send flowers or a remembrance gift to the family of Donald Scott Bannister, please visit our Tribute Store. "Email Address" would like to share the life celebration of Donald Scott Bannister. Click on the "link" to go to share a favorite memory or leave a condolence message for the family.